Fall has officially arrived, and with it comes our 2015 end-of-year fundraising events! The third time was the charm, as we held our 17th Annual "Golf for Hunger & Pool Party" and "Swim For Hunger" 2015 on Monday, August 24, 2015! After two postponements and rain dates, the event finally went off without a hitch with weather that was as wonderful as our loyal supporters. 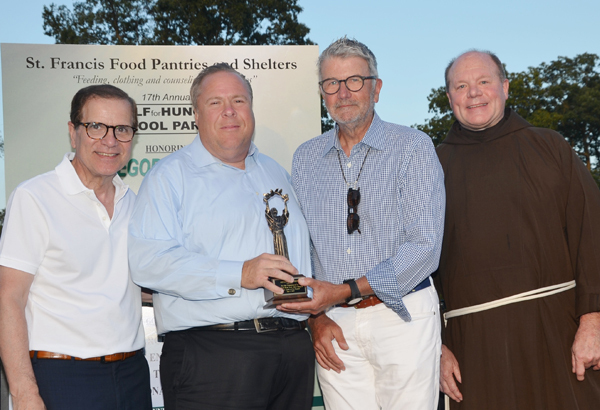 Hosted by James G. Phillips, Founder of TPG Architecture, the all-day outing honored Gregory F. Burke, CEO of Lane Office with "The Francis Award" for his outstanding charitable work. In addition, Thomas Capobianco of the Mohawk Group, Sabrina Messimer, Sr. Account Executive at SBFI and new participant Kara Millaci raised funds with the annual "Swim For Hunger." Our annual Back to School Picnic took place in late August and was the perfect send-off to summer and welcome back to school! An afternoon of food, fun, and friendship set the tone for a wonderful 2015-16 school year. For the third year, Plaza College held its Food Drive to collect can goods on our behalf. Thank you to everyone who supported our annual Back to School Drive to provide children in need with brand new backpacks and school supplies. Among the different “in-kind” donations that we receive are household items. 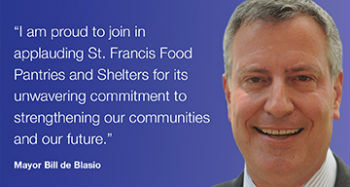 Playing a role in helping an individual/family create a place to call home is something that is important to us.